Capelle Chartering & Trading N.V., Capelle a/d IJssel. Flag: white field; in center two blue block, with two white "C"s cut out, forming together an "S". Source: Brown's Flags and Funnels Shipping Companies of the World, compiled by J.L. Loughran, Glasgow, 1995 [lgr95]. Caraïbische Scheepvaart Maatschappij N.V., Rotterdam. Flag: red field, white diamond, blue "C". The Rotterdam-based Caraïbische Scheepvaart Maatschappij (i.e. Caribbean Shipping Co.) was part of the Nigoco group of firms as described in F. Hoogmeijer and B. Scholten’s ‘Van Nievelt, Goudriaan & Co’s Stoomvaart Maatschappij (Nigoco)’, book, 1995. Martin Heere (1995) draws a tapering swallowtail attached; the design is the same: national colours: red field, white diamond with blue initial ‘C’ (bigger in Heere’s rendering). The few house flag charts I have seen all show the rectangular version. Today we deal in cement, that is to say, it is Cement Tankvaart’s turn to be introduced - the name means "Cement Tank Shipping". Largely belonging to the Dutch Enci BV cement group, itself part of the large German Heidelberg Cement concern, RTC or ‘Rederij Cement Tankvaart’ operates a fleet of nearly two dozen self-unloading bulk ships equipped with tanks, made up of vessels between 250 to 1350 metric tonnes. These facts were gleaned from the Enci website, showing the fleet’s house flag at the bottom of this page: This flag is shown, as a drawing, on the Binnenvaart site but it is not very well done as confirmed by Jarig who saw it in the cloth. His description: green field, (stylized) white letters ‘c’ and ‘t’ enclosing a small black letter ‘r’, together forming a logo taking up a large part of the flag. Some Binnenvaart pages showing the flag (also on photo): vessels ‘Vijzelgracht’, ‘Raamgracht’, and ‘Rozengracht’ respectively: (click camera logo at bottom of page to get to another and better photo). ‘Chamisa-D Tankvaart’ (i.e. Chamisa-D Tanker Transportation) is a small inland tanker operator at Rozenburg on the Nieuwe Waterweg west of Rotterdam, owned by Mr and Mrs Van Damme. Homepage (Dutch only): The single tanker, the hull of which was built at Astrakhan (Russia) and outfitted by the Dutch company Breko, is named after a shrub, chamisa or rabbitbrush. The vessel was acquired in 2005. Mineral oils of various kinds and chemicals are transported between the Benelux seaports and the lower Rhine. Photo album, the first picture of which shows the house flag designed by Chantal [Van Damme]: Direct link to photo showing that flag on the right (Slurink is on the left): The same photo on the Chamisa website. From a (temporarily?) withdrawn page has been taken attachment, a drawing of a white flag bearing gold script ‘C / D / Tankvaart’, initials and word florid and linked, starting with ‘C’ in the upper hoist, then 'D' and ending with Tankvaart’ in the lower fly. See description and photographies: Southwest Colorado Wildflowers website. Our Mts Chamisa-D was named after CHAntal, MIchaëla en iSAbella van Damme. Chantal is my wife, Michaëla and Isabella our daughters. Walter, our youngest son, wasn't mentioned because he wasn't born yet. We have just taken our new mts Chamisa-D into operation - see it here. Jansen & Van Heck in their book “Duwvaart” (pp. 25-28) are very specific on the founding date of ‘Gastankvaart Maatschappij Chemgas BV’ at Rotterdam: 13 August 1965. They add that this firm (“Gas Tanker Shipping Co. Chemgas”) was originally the tanker division of the famous ‘NV Handels & Transport Maatschappij Vulcaan’ at Rotterdam… to be commented upon in future, I hope. Briefly put, Chemgas transports gas, liquid gas, and ammonia. As usual, this source shows the house flag in b/w: on a blue field is a white lozenge containing the black outline of a hexagon with black dots on the corners and three blue waves running through this hexagon. See this chemical-looking flag flying, here. Image above after Josef Nuesse’s site, where however we find a second flag. This one, on a white field with one blue triangle in the upper hoist and a similar one in the lower fly (each bearing three white waves), shows the emblem encountered before in a slightly modified form. The black dots have become little black circles and the three blue waves seem to be flowing away towards the fly! Lastly, under the hexagon we read ‘Chemgas’ in black lower case letters. So there is a bit of a problem, “Duwvaart” gives the blue flag under the name ‘Chemgas’ whereas Nuesse shows two flags, one of which is largely white and bears the name ‘Chemgas’ but stating both of them as belonging to ‘Chemtrans’. We encounter the second emblem or logo on the company website. There seem to be separate transportation divisions: ‘Chemgas Shipping BV’ and ‘Compagnie Fluviale de Transport de Gaz S.A.’ or “River Gas Transport Co.” at Lyon, France (it has a logo in the national colours but I have not yet found a flag). 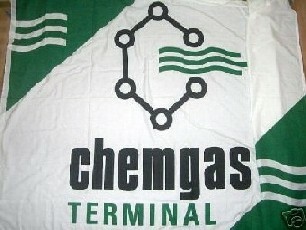 Also found on the net was the name ‘Chemgas Intercoastal’. Could it be that the name Chemtrans was never really used by this firm? A short while ago a related, but probably no longer used, flag turned up in a German eBay offer. This was ‘Chemgas Terminal’ at Vlissingen (Flushing), item no. 150133910818 offered by “line78”, end 25 June 2007. This one differs from the FOTW version in having all blue areas rendered in green and the company name ‘chemgas’ moved somewhat to the right (encroaching upon what would have been the lower green triangle) and accompanied by the word ‘TERMINAL’ underneath, in green letters. Not a table flag for once, its dimensions are given as 150 cm by 220 cm. Source of quote: this page. It should be noted that Chemgas Terminal was renamed when Vopak at Rotterdam took over Chemgas shipping activities a number of years ago. The website of the Dutch company Cotrano BV is under construction (hence, slated for future visit): The company seat is Krimpen aan de IJssel, a little town where the River IJssel joins the Nieuwe Maas to almost immediately reach Rotterdam if you travel downriver. A sand and gravel extractor and seller, Cotrano – a member of both CBRB and VBKO (Dutch association of waterway construction and dredging companies) – operates its own fleet of vessels. See following Vlootschouw page showing ‘Cotrans 8’: The flag is flying and for good measure it is also painted on the steering hut of this barge. Furthermore said house flag appears – as a drawing – on the Binnenvaart site which describes the careers of a number of ships mostly named ‘Cotrans [number]’: orange field, a white trapezium between two white horizontal stripes (not touching the flag’s horizontal edges); on the trapezium an orange stylized initial ‘C’ alongside an orange triangle, both placed above an orange wave. The drawing is too sketchy to rightly determine the width of the various stripes (OWOWO) but it might be 1:1:4:1:1. Jan Mertens reported this link with mainly Dutch houseflags. CTA - white flag, blue open ship, containing red "ct8". What do ‘vletterlieden’ of flatmen do? They help moor all kinds of vessels, tow, transport goods and personnel to and from said vessels, fight oil spillage, help pilots and other specialized personnel, etc. Field of activity is IJmuiden port complex including the locks. Organized into work groups of ten, the entire organization employs about fifty people, most of them being cooperative owners; it has been active “for almost sixty years now”. Equipment consists of so-called winch cars and tractors, a few cars and four motor boats. See ‘Werkmateriaal’ (left menu) to get an idea and admire the flatmen’s skill in throwing cables: short fims reached via red titles at end of first subpage ‘Het “Haakie”’ (i.e. the hook). The photos on the site do not show the flag. Blue flag with white diamond touching the edges, black initials ‘C.V.V.’ in the diamond (which has been drawn with a black holding line possibly absent in real life).